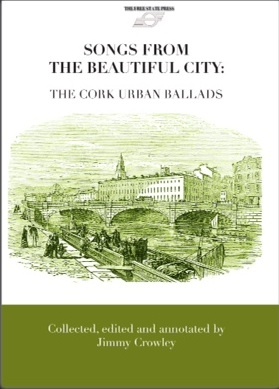 Jimmy Crowley to launch new book ‘Songs from the Beautiful City : The Cork Urban Ballads’ at Cork City Library. Jimmy Crowley is a man who needs no introduction to Corkonians and little introduction to the rest of ye! The renowned balladeer has been singing songs from his native city for decades and many of these are to be enshrined in his new book which will be officially launched on Thursday 14th May at 7.00 in the City Library, Grand Parade. The book will be launched by Mick Moloney, NYU and John Dolan, Features Editor at the Cork Evening Echo. Bígí linn mar sin le h-aghaidh oíche cheoil is scéalaíochta ó dhuine de na ceoltóirí is cáiliúla na cathrach seo!